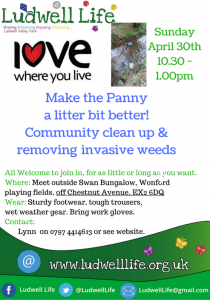 Come along for a spring clean of our lovely Panny and Wonford playing fields. This is a particularly exciting event for us as it’s the first outing for our wonderful new kit – waders to get into the Panny, litter pickers and our fab new hi-viz jackets with the Ludwell Life logo…plus a trolley for putting the bags of litter in. You can do as little or as much as you like. All welcome.